Ferntree Gully News is a bi-monthly, not for profit community newspaper – produced locally by volunteers, and published by the Mountain District Learning Centre in collaboration with the Ferntree Gully Village Traders Inc.
We are published six times a year for distribution to households, shops and community groups in Ferntree Gully. The paper aims to build and strengthen community in Ferntree Gully by reporting on the stories and activities of local people and groups. Launched in 2009 with a print run of 3000, Gully News is now distributing 10,000 copies. All writing, formatting and distribution is done by over 50 volunteers. The paper is a member of Community Newspapers Victoria and has won Awards for layout and feature articles. 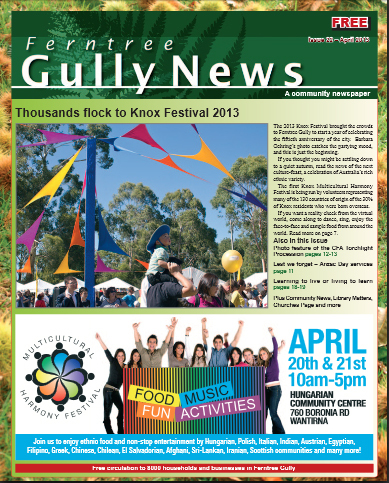 In August 2013, the official Gully News website was launched in response to the increase in news stories coming in from community groups in the Gully and across Knox. In 2009 Mountain District Learning Centre, in collaboration with Lower Gully Traders Association, the Friends of Ferntree Gully and Neighbourhood Watch, relaunched the earlier Village News as Ferntree Gully News, a bi-monthly tabloid format paper. Print media can play an important role in fostering awareness of place and people. The Ferntree Gully News exists to strengthen and connect local community in Ferntree Gully by reporting the positive activities of community groups and individuals. All over Victoria community newspapers are flourishing, reporting the affairs of local organisations, promoting events and educating on issues such as safety, health, sustainability and environment. They are widely recognised as an important source of local news for the communities they serve. We are happy to offer Gully News to a wider readership via this website. Feedback and contributions are welcome. Submissions can be sent to gullynews@gmail.com. For an index to past editions, click here.